Google Earth, the free Earth mapping service by Google, was re-launched with stunning new features. Calling it a “gift to the world”, the all new re-imagined version is weaved with storytelling and artificial intelligence. The announcement which came as the world celebrated Earth Day on April 22, would see the all new Google Earth loaded with a lot of stunning features such as 3D maps of specific locations, learn about random places around the world, take guided tours from their Chrome browser or mobile devices and more. The new feature called ‘Voyager’ would enable the user to digitally explore the planet and be guided through interactive stories told by experts such as BBC Earth, NASA, Sesame Street and the Jane Goodall Institute. Reportedly, there are more than 50 already available- including a tour of the Tanzanian Gombe National Park led by primate expert Jane Goodall and her team. Video journeys to six different habitats is also available which is produced by BBC Earth. Enabling the users to use it at their comfort in computers, smartphones and tablets, Google Earth also have added a feature called ‘I’m Feeling Lucky’ button. Once the user clicks on it, they are taken to somewhere unexpected such as an opera house in Italy or hot spring in Japan and displays knowledge card with interesting facts. It would come handy if a user comes across hidden gems and locations and wants to make a suggestion to the software. That’s not all; the online explorers using mobile version of Earth can capture pictures and send across as digital postcards. 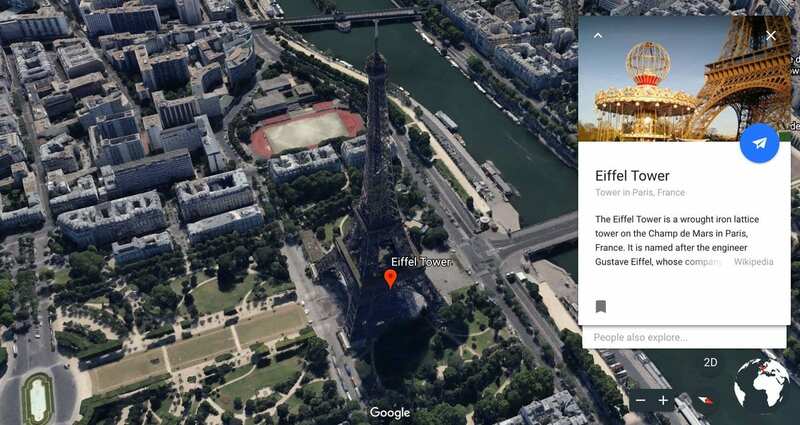 The all new Google Earth would put artificial intelligence on work in the form of the above mentioned knowledge cards, that would let the user dive deeper into online information about mountains, countries, landmarks or other places being virtually visited. It would be capable of suggesting other locations that the user might be interested in exploring based on their past searches. Sean Askay, Earth engineering manager noted that it’s the very first time that they have done this deep integration with Google Knowledge Graph. The company is making it sure that everything that Google knows about the world, the user can know about it. The New Earth has been launched on Google’s Chrome and Android software and soon the versions tailored for Apple devices and other internet browsing software would be made available. Find out the lost civilization with Google. Go to Google Earth -> Voyage -> History -> Lost Civilizations from Above to find them.